Netherrack is the block that makes up most of the Nether. If mined with a stone pickaxe or above, netherrack drops itself. Netherrack makes up most of the Nether. 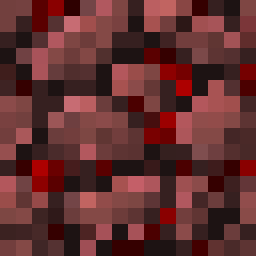 Netherrack can be smelted into a nether brick, which then can be crafted into nether bricks, a construction type of block. It can be used to craft soul sand. It is now used to craft soul sand. If you use flint and steel on it the fire never burns out (supposedly). Doesn't give much light off if you light it with flint and steel though. Netherrack is not renewable since the 1.27 update because it is no longer dropped by nethereyes. This page was last edited on 21 July 2018, at 05:31.